It is said the greater the personality the greater the level of resistance. Such people are exposed to great trial and tribulation. Imam Abu Hanifa had also to pass through difficulties and intense opposition. Like great statesmen, Imam Abu Hanifa faced two challenges and difficulties at the same time. One level of difficulty was the traditional opposition of the kingdom because it was in the times of Imam Abu Hanifa that kingdom of Banu Ummayide came to an end and that of Banu Abbas was inaugurated. He was put behind bars and faced the rigours of imprisonment on regular basis on the orders of Abu Jafar Mansoor of Banu Abbas and last king of Banu Ummayad dynasty Marvan Bin Muhammad. He finally embraced martyrdom when he was compelled to drink poison by the kingdom, the worst sign of tyranny. Neither did he commit any moral crime nor did he cause anyone any injury or damage any other property. His only crime was that he refused to become the part of tyrannical regime through his rejection of high government offices of Grand Mufti and Minister for Finance. This was the physical torture that was perpetrated on him and this came to an end with his demise. There was another kind of oppression, bias and thanklessness which his contemporary religious scholars continued against him. Afterwards religious classes of biased mindsets kept on having the same attitude against the revered Imam. After the passage of centuries, people with similar belief system and warped religious mindset are hell bent on defiling the character of the Imam even today. The biggest propaganda being undertaken by such nefarious elements pertains to his lack of and estrangement from the knowledge of Hadith. How ironic and unfortunate it is that about 80% people of the Muslim world are the followers of the jurisprudence designed by the great Imam, yet he is said to be unaware of knowledge of Hadith. However, it is swing of fate that despite continuous biased efforts and inimical attitude, Imam Abu Hanifa is still the ‘Imam-e-Azam or Grand Imam’. By grace of Allah Almighty he would continue to don this honour as long as this world lives. Shaykh-ul-Islam Dr Muhammad Tahir-ul-Qadri, the founding leader of Minhaj-ul-Quran International, a representative organization of correct message of Islam and religious personages especially jurists and experts of knowledge of Hadith, also focused his attention on this issue in addition to working on other intellectual fronts. He collected the contributions and distinctions of the great Imam on knowledge of Hadith. He organized a prestigious two conferences one in United Kingdom and other in Pakistan before giving his research the form of the book. As usual, keynote speeches of Shaykh-ul-Islam delivered at these conferences were rendered into book form. Religious scholars of every age acknowledged the praise-worthy services of Imam Abu Hanifa and authored books on his knowledge of Hadith. It is interesting to note that more than Hanfi people, it is the Malkis, Shafis and Hambilis who have written more on the Imam’s contributions. These prominent scholars included Imam Abu Abdullah Ahmad Bin Ali Seemri, Qazi Abu Umer Yousuf Bin Abdul Ber Maliki, Imam Muhammad Bin Muhammad Ghazali Shafi, Imam Fakhar-ud-Din Razi Shafi, Imam Abu Zakeria Yahya Bin Sharif Novi Shafi, Hafiz Jamal-ud-Din Yousuf Bin Abdur Rehman Mazi Shafi, Imam Shams-ud-Din Muhammad Bin Ahmad Zehbi Shafi, Mujuddin Ferozabadi Shafi, Hafiz Ibne Hajir Asqalani Shafi, Allama Yousuf Bin Abdul Hadi Humbali, Imam Jalal-ud-Din Suyyuti Shafi, Hafiz Muhammad Bin Yousuf Salehi Damashqi Shafi, Qazi Hussain Bin Muhammad Diyar Bakeri Malki, Imam Ahmad Bin Hijer Hateemi Makki Shafi, and Imam Abdul Wahab Sheerani Shafi. Besides this, work was done on the Imam in both Arab and non-Arab world in last three centuries. But there was a dire need of such a comprehensive and voluminous book which could encompass the excellent contributions of the great Imam to the science of Hadith like his work on jurisprudence. Doing so was historic responsibility of the followers of the Imam. Nature conferred this rare honour on Shaykh-ul-Islam Dr Muhammad Tahir-ul-Qadri. The subjects he held his scholarly discourse on with the help of allusions and references includes difference between knowledge of Hadith and jurisprudence of Hadith, research of the prophetic glad tidings in favour of the grand Imam and the pillars of science of Hadith derived by the Imam. 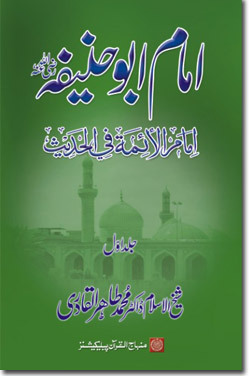 It has been established in the book with the help of historical references that the grand Imam is an heir of knowledge of Hadith of holy companions, Imams of the Prophetic Household and respected Tabaeen and he is the mentor of mentors of many renowned scholars of Hadith including Imam Bokhari, Imam Muslim, Imam Trimzi, Imam Abu Dawood, Imam Nisai, and Imam Maja etc. If the Prophetic traditions narrated by the students of the grand Imam are set aside, nothing is left in the six books of Hadith. 96 prophetic traditions have been listed at the end of the book in order to prove the prologue, which were narrated by the Imam. Diversity of subjects discussed, their beautiful ordering and the provision of material from authentic sources of knowledge are those characteristics of the book which give it an edge over other contemporary books on the subject.